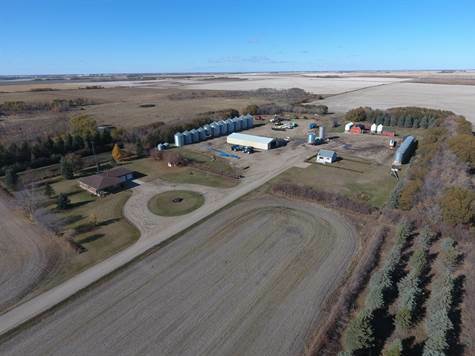 Garage: Double, Attached "32 x 34"
Opportunity with an excellent location awaits on this awesome property only 2 Miles East of Yorkton, SK along Highway #10. The Yard Site, approximately 19 acres, has been well developed including a mature shelterbelt and extensive gravel. The Main House features a full Brick Exterior, very large rooms throughout, and closets/storage space at every turn. In addition to the Main Floor Kitchen there is a second Kitchen in the Basement and a Mud/Utility Room with direct access from the Garage. A 2nd House is rented out and provides a monthly income. The Machine Shed is 50’ x 120’ with a full Metal Frame and Exterior. 164,900 Bushels of Metal Grain Storage is waiting for the high yielding high quality crops the Yorkton area is well known for producing. Power service is excellent and includes both 3 Phase and Single Phase. Nat Gas service to the 2nd House could be expanded to other areas of the Yard. The Land has top notch Assessments of 309,700 & 249,300, Soil Classes of E & D, and with Final Ratings as high as 95.84 is the kind of Grain Land everyone wants to own! This type of Land coupled with the exceptional Yard Site has opportunity written all over it! Land = $597,600 = $2400 for 249 Cultivated Acres. Main House: SAMA Report shows New 1980 and 2252 sq ft.
- Asphalt Shingles, Brick Siding, Wood Soffit & Fascia. - 7’ x 14’ Raised & Covered Deck. - Insulated & Gyproc Interior with 11’6” Ceiling Height. - 2 Overhead Doors, 1 with Auto Opener. - 2 Exterior Access Doors. - 1 Access Door to Main Floor and 1 Access Door to Basement. - Storage Closet, Central Vacuum Power Unit. - Main Entry – Access to Exterior and Garage. - Main Entry Hallway – Linoleum Flooring, 2 Closets. - Dining Room – Linoleum Flooring, Built-In China Cabinet, Storage Closet. - Kitchen – Linoleum Flooring, Oak Cabinets, Pantry, Fridge, Stove, Dishwasher. - Front Entry Hallway – Linoleum Flooring, Closet, direct access to Covered Deck. - Living Room – Carpet Flooring, 2 Ceiling Light/Fans with Remote Control. - Bathroom – Linoleum Flooring, Shower, Toilet, Oak Vanity/Sink & Mirror, Closet. - Office/Laundry – Linoleum Flooring, Oak Cabinets, Sink, Clothes Washer & Dryer, Closet. - Bedroom – Carpet Flooring, Closet. - Bedroom – Carpet Flooring, 2 Closets, Ceiling Fan. - Bedroom – Carpet Flooring, 2 Closets. - Main Bathroom – Linoleum Flooring, Oak Vanity/Sink & Mirror, Toilet, Bidet, Tub/Shower, Closet. - Hallway – Linoleum Flooring, Closet. Basement: Access from Main Floor & Garage. - Kitchen – Linoleum Flooring, Oak Cabinets, Stove, Fridge, Pantry. - Cold Room – Cement Floor, Wood Shelving, Culligan Reverse Osmosis Drinking Water System. - Storage Room – Cement Floor, Wood Shelving. - Rec Room – Linoleum Flooring, Built-In Wall China Cabinet, Storage Closet. - Bedroom – Linoleum Flooring, 2 Closets. - Bedroom – Linoleum Flooring, 2 Closets, Storage Closet. - Bathroom – Linoleum Flooring, Oak Vanity/Sink & Mirror, Shower, Toilet, Closet. - Utility/Mud Room – Direct access to Garage, Cement Floor, Electric Forced Air Furnace, Wood Forced Air Furnace (Never Used), Electric Water Heater, Culligan Water Softener (rented at $30.30/Month), Oak Cabinets, Septic System Pump, Water Pressure Tank, Sump Pump, 400 Amp Main Electrical System. Well: 30” Big Bore, Galvanized Cribbing, located South of House. Septic: Cement Dual Chamber Holding Tank with Liquid Pumpout SW of House. 2nd House: SAMA Report shows New 1950 and 728 sq ft on Main Floor. - 11/4 Storey, Stucco Exterior, Asphalt Shingles, Block Basement. - Rented for $600/Month, includes Utilities. Well: 40” Big Bore, located North of House. Septic: Cement Dual Chamber Holding Tank with Liquid Pumpout SE of House. - Straight Wall Metal Frame & Exterior. - Cement Foundation, Gravel Floor, 100 Amp Main Electrical Panel. - Overhead Equipment Door, 15’6” High x 24’ Wide, Auto Opener (not working). Storage Shed: 16’ x 23’ Metal Curvet, Wood Floor. Storage Shed: 12’ x 16’, Asphalt Shingles, Wood Frame and Exterior. Barn: 28’ x 40’, Asphalt Shingles, Wood Siding, Cement Foundation & Floor, Loft, Power, Big Bore Cement Crib Well located on East Side. - 6 x 15,000 Bushel Darmani, Flat Steel Floors, Aeration with 3 Phase Fans. - 4 x 8000 Bushel Twister, Flat Cement Floors, Aeration with 3 Phase Fans. - 1 x 7500 Bushel Bridgeview, Hopper, Skids, Aeration with 3 Phase Fan. - 1 x 4700 Bushel Westeel, Hopper, Skids, Aeration with Single Phase Fan. - 10 x 2000 Bushel Westeel Rosco, Hoppers, Cement Pad. - 3 x 1700 Bushel Westeel, Smooth Wall Fertilizer Hopper Bins, Skids. - 2 x 1500 Bushel Metal Industries, Smooth Wall Hopper Bins, Skids. - 2 x 1300 Bushel, Flat Steel Floors. - Cement Pad, 3 Phase Power. - 164,900 Bushels Total Grain Bin Storage. - Excellent location with Direct Pavement Access from Highway #10 only 2 miles East of Yorkton. - 3 Phase & Single Phase Power. - 3 Big Bore Wells. - Extensively Graveled and Landscaped Yard.